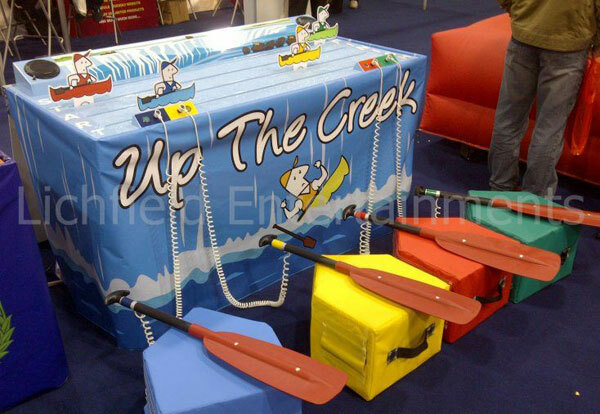 Up the Creek is our fantastic interactive electronic rowing race game and the unique to us. Up the Creek is an interactive electronic rowing game for two to four players. The players sit on the coloured bases and on the whistle start paddling with their oars. The oars are fitted with sensors and the faster you paddle the faster your boat will move along. The first to the finish line wins. This is a great amusement for team events,corporate events, fun nights etc and is supplied as standard with a member of staff. If you have any queries, questions, or would like to book Up the Creek for your event please click here to enquire and we will do all we can to help.